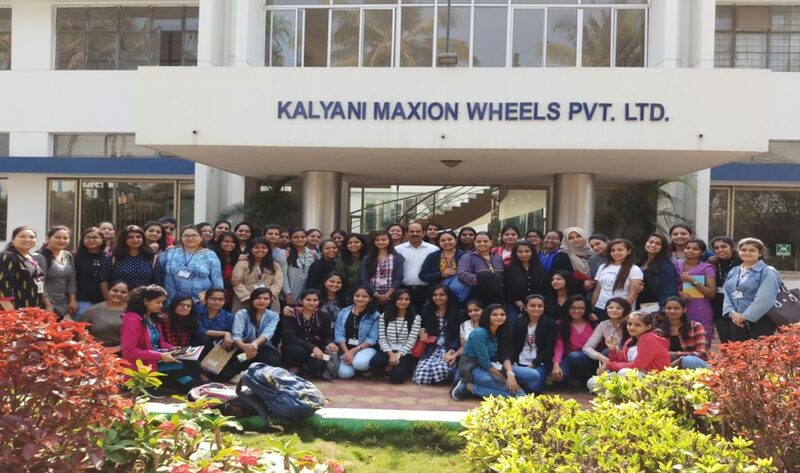 Kalyani Maxion Wheels Pvt. Ltd. is the largest Forging Company in the world. It is No.1 in manufacturing Engineering Steel and Axle Aggregates and No.1 Indian Exporter of Wheels. Students were taken to the training Hall where a brief introduction about the company and the Chakan Unit was given by Mr. Sunil Bhatambrekar (Engineering Manager). He shared with the students how vision and leadership leads to successful enterprise with the example of visionary leadership of Mr. B. N. Kalyani (Group Chairman). 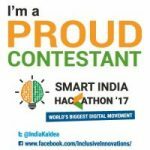 The company focuses on quality and out of 1 lakh units produced in a year only 1% goes in scrap. Ms. Shruti Dewarda working as Assistant Manager HR shared the process of hiring, training and other important HR functions in the company. The students visited the shop floor and witnessed that most of the operations in the manufacturing process were automated. Rules and regulations about assuring quality were also discussed with them. The visit helped students learn the practical lessons of operations management, HR Systems and functions and how an idea from a visionary leader can result in a successful business. This industrial visit exposed our students to myriad of topics that were handled by 4 resource persons of Barclays Technological Centre. Amongst these, 2 of the resource persons were seniors in the organization, namely, Mr Gajendra, taking care of the CSR activities and on the other hand was a Team Lead, Mr. Vishal, the other two resource persons were new joinees, Mr. Sumit and Mr. Tarang who shared their work experience and professional journey up until now. Initially, there was a discussion held on legacy of 327 successful years of Barclays, the operations undertaken by this center and what is their contribution to the overall operations of Barclays. 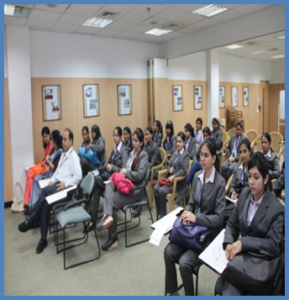 The students then proceeded to ask a few questions with regards to the organizational hierarchy, recruitment policy, grievance redressal procedure and employee engagement activities held at Barclays, which were satisfactorily answered by all 4 of them. The visit concluded with 2 of them guiding the students on interview skills basis their hands-on experiences at conducting interviews. Students were taken to EATON, Pimpri, Pune [A power management company supplying safe, sustainable and energy-efficient solutions to business units in the fields of electrical, vehicle, hydraulic, health care and mechanical sectors] to study their journey as a global leader in the power sector as also their operational processes. 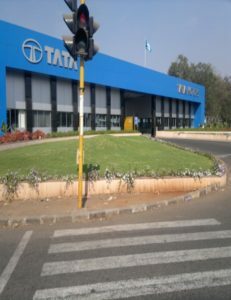 Company introduction and tour was arranged by AGM , Mr.Amol Patil. 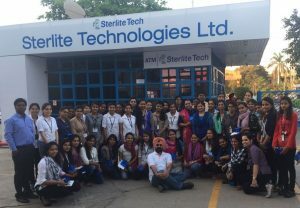 Students witnessed actual manufacturing processes on the shop floor, where they were told about the various safety measures to be followed while working on machines, procedures for TQM and simplest techniques of project management followed by them. It is to broaden the outlook of students with exposure to different workforces from different industries that we had arranged industrial visits to various organisations in Dubai. 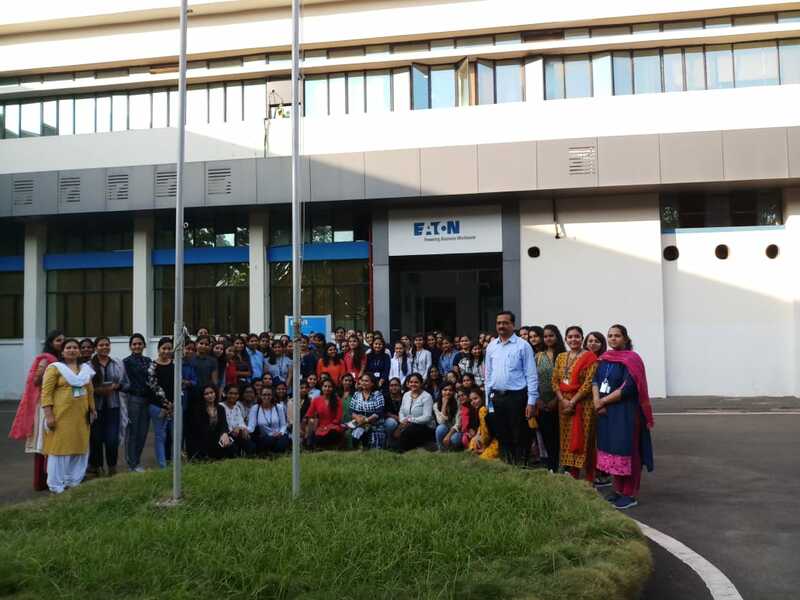 However, our objective of this industrial visit extended beyond, just broadening the outlook of students, we also wanted to open new horizons for them to learn and grow. This industrial visit was planned from 7th of October 2018 to 13th of October 2018. On 8th October 2018, we moved around the shopping streets in Meena Bazaar discovering the different souks and studying the market broadly as to the specialty of markets in Dubai, how there are so many things and food items made available keeping in mind the interests of Indian tourists, what are the ways of promotion that are made use of, by the sellers in Dubai. In the latter half of the day, we visited Gulf Can factory. Here, again, we were first briefed about the whole process of manufacturing the cans, shown different varieties of cans and then we were divided in to 3 groups, accompanied by 3 lady managers respectively, to witness the making of the cans with the help of the machines in the factory premises. The machines were laid out very neatly and safely. We observed that, there were a handful of workers who were needed on the shop floor due to the whole process being automated. A visit to the Eros Group was planned for 10th of October 2018. Mr. Gidwani, the CEO of the Eros Group ran us through a presentation on the Eros Group and then, we had a small interview session with him, trying to understand the nitty-gritties of his journey to Dubai and to the position of a CEO. He largely emphasized the value of having a vision statement by every individual and the importance of operating ethically in the professional as well as personal life. During late afternoon hours, we called on our alumni, Ms. Pooja Ghodekar who was placed in the Eros Group, Dubai to share her insights on working in Dubai, the professional and personal life in Dubai. It was a candid conversation that we got into and she patiently answered all the queries. On 11th of October 2018, while moving amidst the hustle and bustle of the markets, we identified various formats of retail businesses like that of discount stores, the regular mom-and-pop stores, supermarkets and category killers. Later, we headed to the Burjuman Mall and tried to study the layout of Carrefour, a hypermarket. Mahabaleshwar-Panchgani is India’s own strawberry county. Over 80 percent of the country’s strawberries are grown here. In the midst of this beautiful landscape is situated the MAPRO FOODS PVT LTD. Mapro was founded in 1959, by Mr. Kishore Vora a pharmacist by profession. Mapro’s portfolio of products provides a high quotient of natural fruit in the form of jams, fruit bars and chews, syrups, crushes, squashes, and dessert toppings. The rise of modern retail has given Mapro a nationwide network. Their revenues have risen from Rs 25 crore in 2006/07 to more than Rs 500 crore in 2016/17. 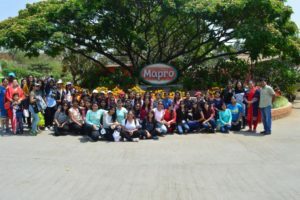 Students were taken to Mapro to study their manufacturing process and witness this courageous journey of entrepreneurship. The students were shown three short videos on the history and procedure of manufacturing different types of products of the company. Then the students were guided to watch the actual manufacturing units of the company. They witnessed first-hand, state-of-the-art production facilities used by Mapro to develop, produce, package, store and sell food products, to meet and exceed customers’ expectations. Students also visited the Mapro Gardens to savour some of their yummy products. Sanjana Israni and Ria Mathew won gift coupons for asking intelligent questions about production related activities of Mapro. Students came back motivated on learning that entrepreneurs with a vision and commitment to customer satisfaction can be successful despite constraints…it is not without reason that Mapro has risen from a non-entity to India’s largest producer of syrup, jams etc. 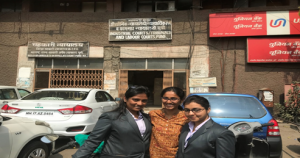 Students of MBA (HR) speclization visited the Labour Court to know the role of the court in dispensing justice and the way cases are handled. Students heard cases on illegal termination/ suspension of employees. Sterlite Tech develops and delivers optical communication products, network & system integration services and software solutions for telecoms globally. It is India’s only integrated Optical Fiber producer and one of the largest suppliers of Optical Fibers to overseas markets in China, Europe and South East Asia. The main objective of this visit was to give practical insights to our students and help them link their classroom inputs with the real world of work in different areas of management like Finance, Marketing, and Human Resource. 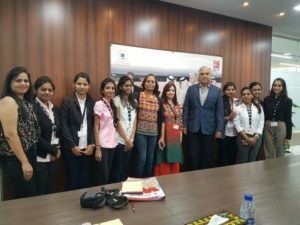 On 15th September 2016, Students interacted with Mr. Niranjan Gidwani, Dy. CEO of EROS Digital Home and visited four industrial units in Dubai, Ajman and Sharjah on 14th September 2016. The company deals in numerous brands such as Samsung, Hitachi, TCL, Linksys by Cisco, Candy Flip, Thermobreak, Lennox, Aiphone, Du, BenQ, Taurus. Eros digital home owns 15 outlets in Dubai and four stores in Abudhabi and Alain. 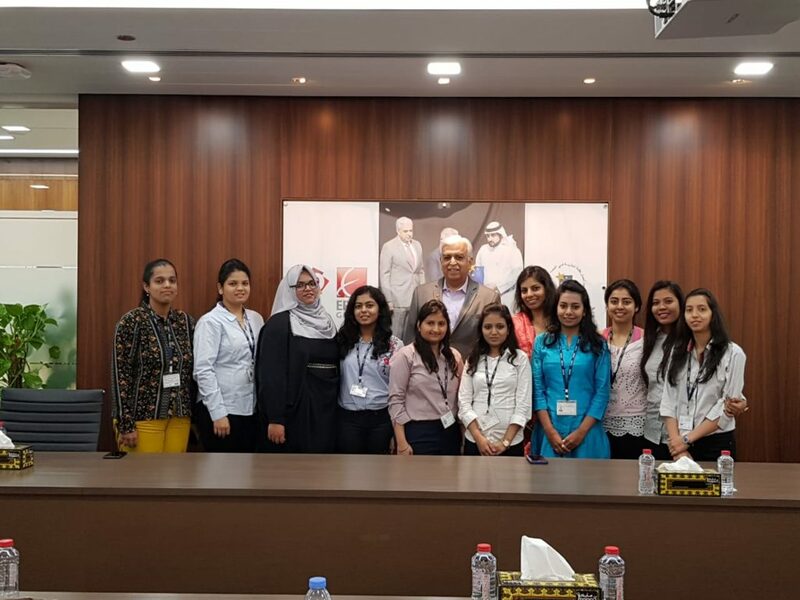 In their interaction with Mr. Gidwani, students learnt about impact of change in government policies on the business in Dubai, marketing strategies for various electronic products in Dubai and how these differ from those in India, business forms in Dubai, demographics and legal procedures for starting a new business in Dubai. On the HR front students were enlightened about to the desirable competencies for a suitable candidate for a corporate job. Students visited Khushbu Industrial Co LLC, a company manufacturing comforters, pillows and linens in Ajman, UAE. The company manufactures thousands of pillow and quilts daily which are sold for household consumption and also supplied to hotels in the UAE region. Students observed the pillow, mattress and bedcover production process and were acquainted with compress technology used for packing the pillows. As a result, the space consumed by pillows and quilts is reduced and can be transported in large quantities. They were also informed about HR policies such as wage rates, leave policies prevalent in Dubai. 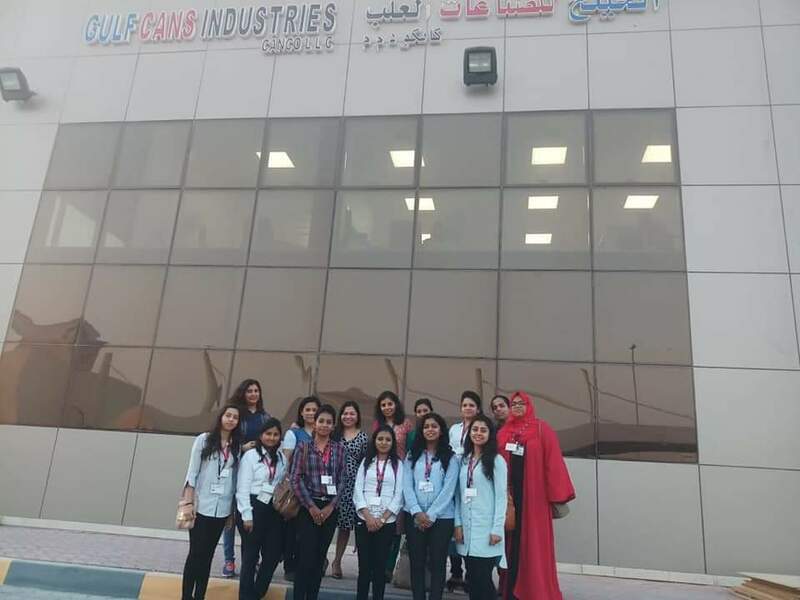 Students also visited Paragon Footware Ind LLC, a footwear production company in Ajman which is equipped with state of the art manufacturing facility. The company manufactures comfort footwear for men, women and children. Students observed the shoe-manufacturing process using robotics and gained knowledge of multiple steps, almost 30 odd steps involved in manufacturing a pair of shoes. They also got a glimpse of how a sole is manufactured using the cooling and pressing technology. 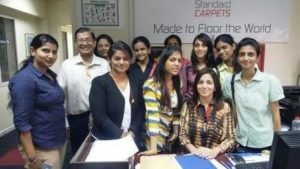 Later they visited Standard Carpets Ind LLC, the largest carpet manufacturing unit in UAE. It is engaged in export of carpet and carpet tiles to 60 countries across the globe. Students observed vertically integrated expansive carpet manufacturing process from making of the yarn till the final weaving and computerized carpet design process. They also visited Neelkamal Plastic Factory LLC, which manufactures blow molded and PET bottles from 200 ml. to as large as 30 ltr. capacity containers for lubricants, chemicals, detergents, dairy and edible oil industries and manufacturing of injection molded items such as lids, caps and closures. Besides they observed the in-house tool room for the manufacture and maintenance of moulds and machines which enables the company to produce an extensive range of products as also the screen printing and labeling process for PET bottles. Sudarshan Chemicals is a leading color and pigment manufacturer. 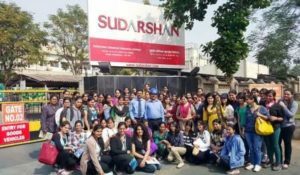 Students were briefed about the evolution of Sudarshan Chemicals, its product portfolio, marketing strategies and brand positioning all of which has helped transform the company into a world class global solution provider. Thereafter students visited the plant and witnessed the production processes. Katraj Dudh Sangh is a district level co-operative organization registered in 1960, involved in processing milk and milk products. The representatives of milk producing farmers based in rural areas encompassing almost the entire Pune district, manage this organization.Their product profile includes Standard Milk, Toned Milk, Cream, Ghee, Shrikhand, Amrakhand, Malai Paneer, Mataka Dahi, Flavored Milk, Lassi, Jeera Tak, Table Butter, Milk Powder and Softy Ice cream. Milk Processing Unit of different milk Products. The Reliance Industries Ltd., Nagothane Manufacturing Division comprises of an ethane and propane gas cracker plant and five downstream plants for the manufacture of polymers, petrochemicals, fibre intermediates and other chemicals. The Nagothane Manufacturing Division is a petrochemical complex. It uses world class technology to manufacture polymers and petrochemicals. The products which they manufacture match international standards. They produce 7 lakh tonnes of polymers and chemicals in a year, making them one of the leading manufacturers of polymers in the world. Students were taken to the Learning and Development Center where a brief introduction about the Nagothane Manufacturing Division was given. Mr. Surendra Patil, HR Manager touched upon topics like Sustainable Social Development, Waste Management, Health and Safety, Asset Management Practices, Reliability, Failures and Cost of unavailability etc. He also made a presentation on the Employee Handbook of the company to familiarize the students with the basic code of conduct, the work responsibilities and the facilities provided to the employees. 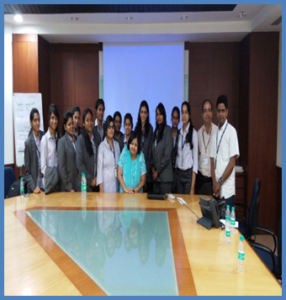 A presentation entitled ‘Unleashing ‘R’ Potential’ by HR Executives Ms. Pallavi and Ms. Shrutika was also made. 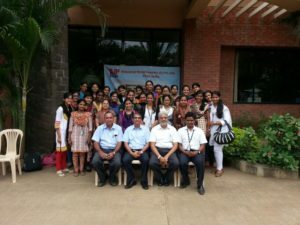 It acquainted the students with the core HR practices followed by Reliance and the Nagothane Division along with a list of activities conducted throughout the year in the company and statistics and trends related to employee attrition. After a short break for lunch, the students were taken around in the Reliance bus to the Nagothane Division Control Room where they saw the computers plugged in to monitor every activity that took place in the plants. Mr. Harsh Yadav, an engineer at Nagothane, took the students through the process of production and manufacturing. Following that, Mr. Patil took the students on a tour of the entire Nagothane Division and showed them all the plants that were functioning on the property along with warehouses that stocked the finished products in the form of bags filled with polymers. Students observed at close quarters how the bags were filled, how the weight of the bags was checked and how the bags were either accepted or rejected based on their weight. Mr. Patil mentioned that these polymers were used to make milk pouches and injections. This visit helped students gain insights into Production Planning Process, Best HR Practices and Supply Chain Management (SCM). At SEBI students were guided on the various divisions of SEBI and their role, activities performed by SEBI and its role as regulator in the Securities market. They also learnt about electronic paperless market, credit rating agencies, commodity derivatives etc. 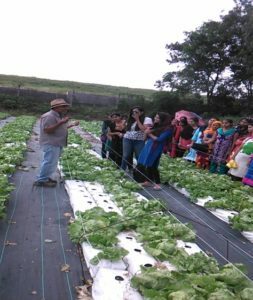 SVIMS organized a visit to Green Tokri, one of the pioneers in salad farming in Maharashtra. The farm manager conducted a session for the students on diverse varieties of salad, how they are different and their benefits. After the session the students visited the vegetable and the salad field and learnt how to plant salad saplings. Thereafter, the field manager discussed about the latest technologies in the Indian salad farming like computer-operated drip-irrigation system which provides the required amount of water and fertilizer to the plants. JOHN DEERE EQUIPMENT INDIA PVT. LTD.
Students visited the Engine Shop, Transmission Shop and Manufacturing Shop. Accompanying executives helped them understand the application of academic topics such as Supply Chain Management and “Just in Time” methods demonstrated by a live assembly line on which they saw a tractor being built from a single piece of raw material to a finished product. The visit to the shop floor was followed by a question- answer session. 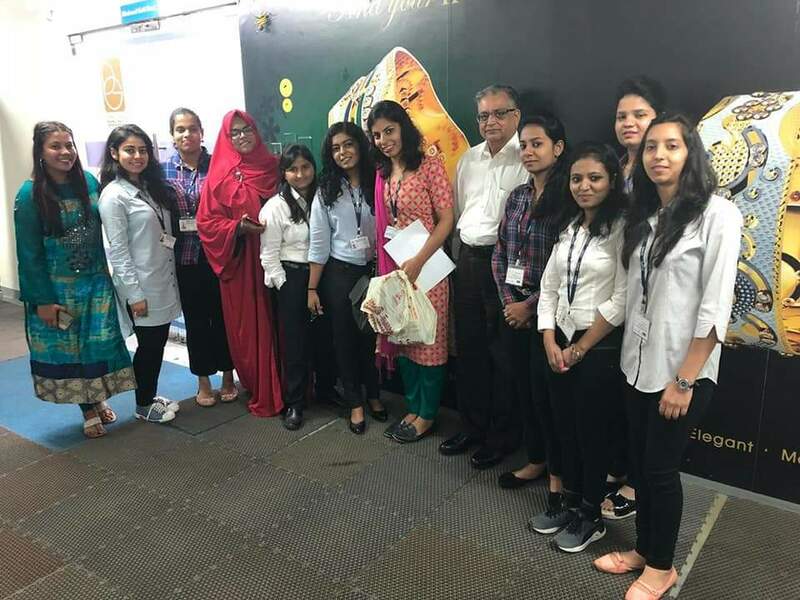 An Educational visit to NSE (National Stock Exchange) and SEBI (Securities Exchange Board of India) was organized for the students of MBA- Part II (Finance and Marketing specialization). 31 students and 3 faculty members undertook this visit. At NSE, the first presentation was Introduction to NSE and its establishment. This included an overview of Capital Market which comprised of different securities traded at NSE and details of various sessions on trading days. The speaker gave a practical example of how brokers trade with the help of software system called NEAT. There was also a presentation on NCFM i.e. NSE’s Certification in Financial Markets. At SEBI, the opening presentation highlighted the Topic Let’s Learn New Things and Unlearn the Wrong Things. We learnt about various investment avenues and the three considerations before investing in any product i.e. Safety, Liquidity, Returns. We unlearnt that Savings= Income- Expenditure and learned that Expenditure= Income – Savings. Mrs. Agarwal, AGM ( Investor Awareness and Education Dept.) addressed the students and answered their questions thereafter. The students received valuable inputs on Brand Vespa, its history, its current marketing strategy and its priced ‘niche’ market share. 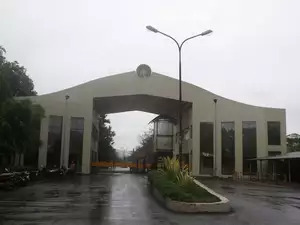 They also saw first hand, the Welding Shop and the robotic assembly line where the world famous PAS (Piaggio Assembly System) has been implemented, and view and understand Kaizen in operation. 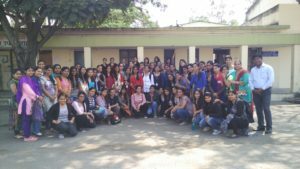 We were privileged to have our students visit IMP (India) Pvt. Ltd. a world leader in the manufacturing of Electrolytic Iron Powder and Flakes, on a personal invitation from its Director, Mr. Prakash Dhoka. They were deeply appreciative of the company’s impeccable quality control set up and infrastructure facilities; its cutting edge R&D efforts; its admirable CSR activities and excellent HR policies.